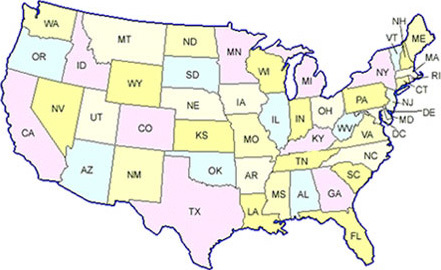 The continental USA (the 48 contiguous states) grew haphazardly over the years. Founders of the 13 original colonies probably had no concept of the Mississippi River, the Rocky Mountains or land along the Pacific Ocean. Land was added later thru treaties, purchases, and some designations are awkward - where is the delineation of 'Midwest' the west, etc. To the early pioneers, 'west' referred to the land on the other side of the Allegheny Mountains. The Louisiana Purchase, Santa Fe Trail, and the Oregon Trail redefined the west. The Plains in the 'Midwest' have always had vague boundaries. Is Chicago really in the Midwest? Is Dallas, Oklahoma City, Denver? 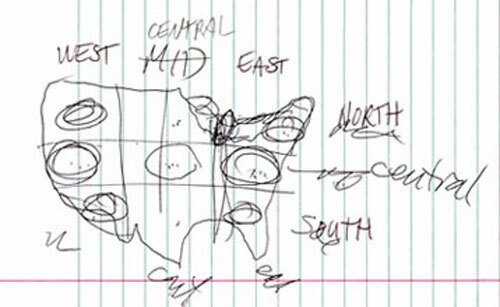 If we could ignore the deep-rooted names and seek a clearer way to designate areas of the USA, we might propose divisions that break the nation into 9 areas, a 3 x 3 grid. This has always fascinated me (as has redefining state boundaries to make more sense). Research shows that many people have addressed the issue and proposed solutions. 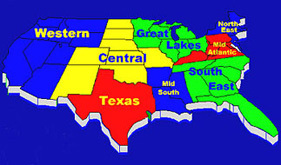 The one on the left has some problems, examples: Oklahoma in Gulf Coast, Tennessee in South Atlantic, and Kansas in Great Lakes. Those designations defy logic and intuitive understanding. The middle one: New Mexico in Central? The map on the right has some logic to it but the West and the Middle West are just too large to help simplify and define regions. So, here's another proposed solution. 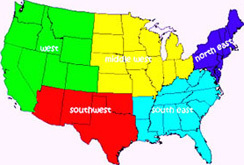 Nine regions, each distinguishing a region with more equity and logic. The designations east, west, north and south make sense. If the country could be divided into quadrants, that's all we would need. But no such luck. 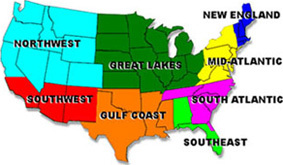 It gets tougher deciding on the east-west and north-south bands that run thru the central middle of the country. California should probably be cut in two since the southern part is more Southwest in attitude and connection. 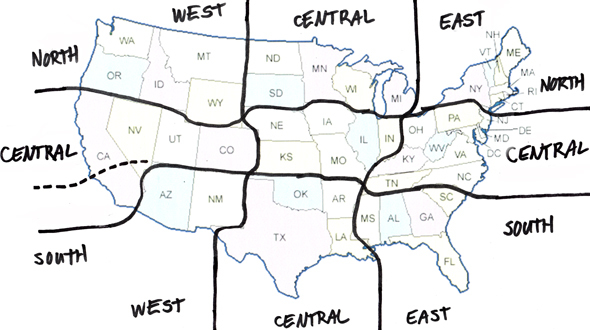 Using Central avoids the confusion from Mid West and Mid East - we are conditioned to think the Mid East is Arabia and the Midwest is Illinois, Iowa, and the Plains states.